I really like the farmhouse as a location and I have been thinking of what 'story' to tell through it. The first idea I had I've created as a concept below. It is based around the farmhouse being alight with part of the roof swamped in fire. The view is subjective, with someone looking from below and back. In the scene there is also a empty petrol can, resting next to a tractor. This brings ambiguity,as the petrol can deserves to be there to fuel the machine, but it can also be linked to the fire, which could have been deliberate. 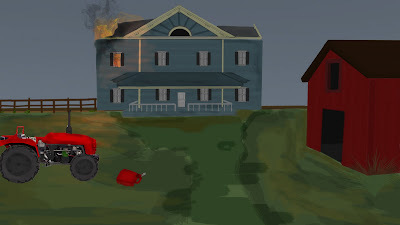 Note: In maya I want to add more objects and detail around the barn, as well as some tall cornfields next to the house, I will add this to the concept if this is the one I choose to progress with. I want to explore another angle,and that is using the house to portray a suspected murder, with a hole being dug in the ground, next to a resting shovel in the front lawn as if a body would be buried. There will be a light on in the front of the house with a figure in the window. I will have a crack at that concept later. Nice ideas, I really like the link you've made with the petrol can either being used to fuel the machine or the fire. Thanks for the feedback Phil. I've been looking through photos to see what rusty old machinery I can place around the barn to make it seem more atmospheric. I was worried about the fire as well, it seems too straight-forward, which is why I've been considering another angle - more 'Ed Gein'. The camera-shot I want to finally portray is as if someone is watching from the overgrowth.